Many of my friends really think I am a bit over the top when it comes to cruising. My Wife and I started cruising in 1995. Up until that year, we had traveled only via our own made to order trips, or land tours we booked at travel agencies. There were no online travel agencies at the time. My concern was that I did not want to be stuck on a “boat” with a bunch of people for 7 or more days. Does that sound familiar to some of you out there? Or that I would be bored. Well we always had this tradition of going to the warm Caribbean every other year to escape what used to be our very cold and snowy winters. We started with 4 or 5 days. By 1995 we did a full week. Today, in Washington, D.C. we barely get much winter anymore. But back in the 1980’s and 90’s, we had extended cold waves. And trust me when I say that when I was a working stiff who had to go downtown everyday, it could get pretty bitter cold. And it was not uncommon to get a foot or more of snow in January or February. So we would head to St. Thomas at a resort every other year. We really liked Frenchmen’s Reef for example or Bolongo Bay when we were short on cash. 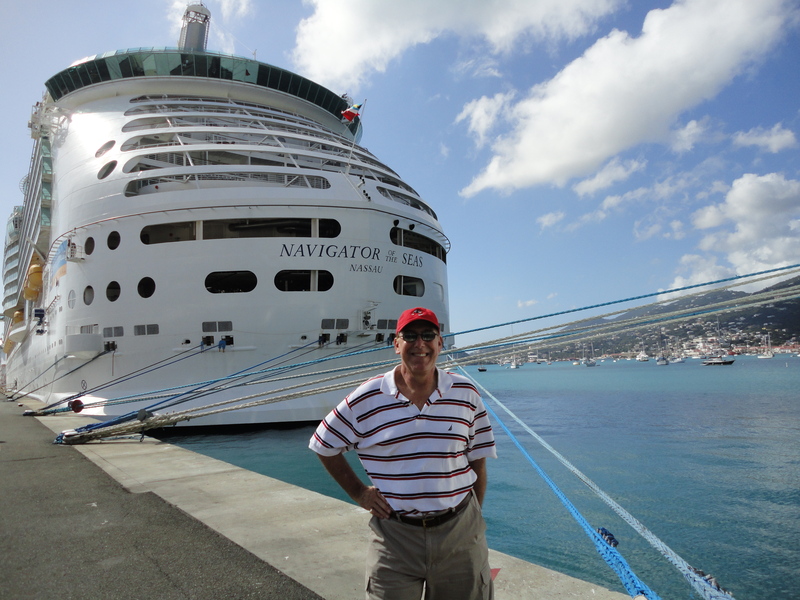 We also went to St. Marten, Nassau, Bahamas, Cancun, Barbados, Aruba, and Puerto Rico. But this one year, in the fall of 1995, there were a series of bad hurricanes that hit many of the Caribbean Islands. And it was our year to head to somewhere warm. The only spot that was not hit by hurricanes seemed to be Puerto Rico. But we had been there and wanted something new. So I told my Dad, who is no longer with us, that I think we were going to go down to Puerto Rico for a week in February. And he gave us this look that only a Dad can give. Puerto Rico he said? Why are you not cruising, he said. All his friends were cruising. And they said it was the best vacation ever. And then without skipping a beat he said the magic words — “I will chip in.” Well when I heard those words I was sold. So on a early fall day in September of 1994 – my Wife and I decided to investigate. We went over to our nearby Cruise Agency (yes, believe it or not there were brick and mortar agencies that only did cruises) — and it was in Alexandria, Virginia. So we went into the “Cruise Connection” and we met with a travel agent, we called “Captain Bill” because he was retired Navy and loved selling cruises. I think he was a freelance agent on weekends. So we told him we had never been on a cruise before and what would he recommend? So he pulls out these big books of cruises and then shows us this one catalog and it happened to be a catalog of Celebrity Cruises, and they are still very much in business today and they are adding some incredible new ships next year including the ground breaking Celebrity Edge with movable restaurants and infinity balcony cabins. So he pointed to this one cruise he thought would be perfect for us. It was the Celebrity Horizon, a 45 or 50 ton vessel built-in the late 1980’s. The nice thing about this cruise is that it hit like 6 island ports, which in today’s world is not super likely. Most Caribbean cruises today hit maybe 3 to 5 or so ports in a 7 day cruise. We went from Puerto Rico on down into the southern Caribbean. And the ports were awesome. We spent hours basking on many different beaches. We went to the Dominican Republic where Celebrity had a private island and we saw Punta Cana with shops and restaurants. We went to rustic and very Caribbean Martinique which was awesome. Barbados where we spent the day at Sandy Lane, that sat right now the beach. Antigua had great beaches. Of course Puerto Rico we walked around the old town. And much more. We met some really cool friends and one lady happened to be an artist. And so she sat on the rocks in Barbados, and she painted us a picture of the ocean and beach. Now this was in 1995 and today it is 2017, 22 years ago. And we STILL have this picture that we have saved all these years. And Celebrity Cruises service, food and entertainment plus the cruise got us sold on cruising and from that point forward we ended up doing a cruise once each year in the winter. As of Summer 2017 I am embarrassed to say that the Wife and I have done over 40 ocean and river cruises since that first cruise and we have actually lost count. It may be more. Well since we are travel agents, we tend to do ship conferences and short 2 and 3 day cruises too. So they are not all these long cruises. And we still enjoy doing resorts too. So never discount cruising. You just never know how much you will like it. For example, unpack once and let the “hotel” take you around the world. We have gone to the Mediterranean, the Norther Capitals of Europe, Australia, Hawaii, Alaska, the Caribbean of course, the Panama Canal, and much more via a cruise ship and its an easy way to travel and we have enjoyed every minute of it. And the big ships, its going to be rare that one gets sea sick with their new stabilizer architecture. Or there is always the medical center to help you out. And avoid the stormy time of the year, which helps a lot too. I always say the most stable stateroom is going to be lower deck, mid ship, which may require an ocean view and not a balcony. Sorry about that. So please give us a holler if you are ever in the mood to cruise. See our web site where you can search for all sorts of cruises. Cruises Inc. has so many exclusive offers that save you some big bucks. Go to http://www.Michaelstravel.net and take a look. So I have rambled on way too long. Let me close by saying that there are ships out there for every budget, every type of travel or thing you like to do, every itinerary, upscale luxury and river cruises through the great rivers of Europe, to modest contemporary lines for active families. In my early days we did not have this variety. But the Gen X, Y and Z generations that are now getting into travel (and travel agents I should say), are so fortunate because there is something out there for just about everyone. Read my latest blog as I was able to figure out how to post my first video to WordPress. Wow I am so proud of my accomplishment. This means that from this point forward my blogs will be richer and more interesting. So stay tuned as my blog grows and comes to life to be even bigger and better than ever. And thanks to all of you who are following me right now. Happy Travels.